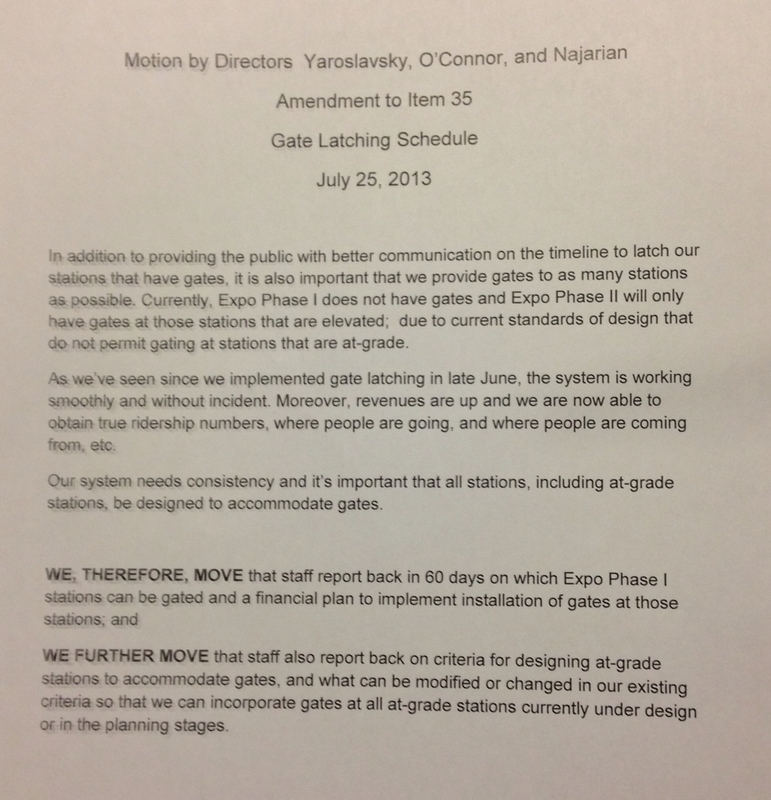 The Metro Board just voted to approve the motion below by Board Members Zev Yaroslavsky, Pam O'Connor and Ara Najarian to study the possibility of adding gates to some stations along the first phase of the Expo Line, which runs from 7th/Metro Center to Culver City. Gate latching at Red/Purple Line stations is currently underway and will then continue with some stations for the Gold, Green and Blue lines. Gates are scheduled to be built at the National Palms, Sepulveda, Bundy stations for phase 2 of the Expo Line with Colorado/4th under discussion. No need to build them so extravagantly at huge taxpayer expense. Just rebuild it so it looks like a simple single story home. Wall off the sides so that no one can’t get onto the platform without going through the gates. Entrance leads in directly to the platform. Add in a small vendor space like mini 7-Eleven or something to make extra money to help pay for the maintenance costs and improve security in these stations. Improve station signage with bigger letters. Hire local home builders and general contractors to create jobs as they have the expertise in building homes efficiently and cheaply than big name contractors which are likely to have huge cost overruns. Use local home improvement stores for materials like 2x4s, drywalls, electrical, piping and other stuff to build the station like this. As with everything, Japan has figured out solutions to everything long ago. Just do what they do and the answers to your problems are solved. 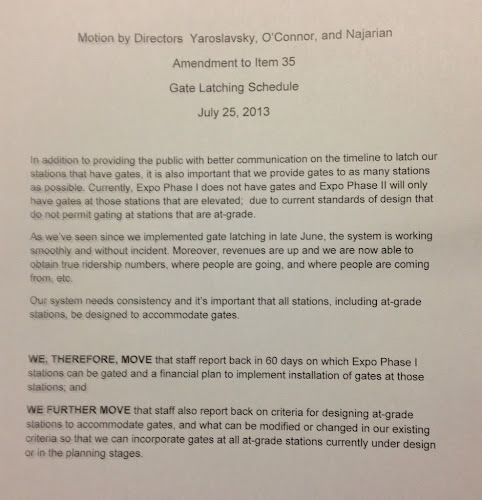 Why cant at grade stations get the gates? Just look at the gold line stations that are in the median of the freeway, they have 2 gates and I thought it was well positioned. The three elevated stations at la brea, la cienega and culver should have had gates from day one. I see too many fare evaders on the expo line and it makes me angry. Just from Japan, how can Metro have 7-Elevens at the stations? Metro rules prohibit people from eating and drinking on trains and even buses, even though I have see people do it many times. And I agree with the above comments that gates for the train stations should have been put in place from day one. They have had gates in New York and Washington, DC for decades. I can not believe that LA is so far behind times. Wait a minute. Why were the Expo Line Phase I stations not gated in the first place? They were already installing gates and turnstiles in the Red and Purple Lines before Expo opened. Didn’t Metro expect that a gated system was the way moving forward? Did the concept “let’s install the gates at these Expo Line stations before it actually opens because we’re moving to a gated system anyway” ever cross anyone’s brain at Metro? Or did they figure they can open the stations under the honor system first, then come back to it and fix it later at the expense of taxpayers? Is this the Metro standard? Is Metro going to keep opening up new stations along the Expo Phase II, Crenshaw Line, Regional Connector and the Gold Line Extension without fare gates? Or are they from now on, going to build the stations with gates pre-installed before they actually open? I am with others that we do not need more “well duh” government studies. All they do is waste precious tax dollars and are huge waste of time just to come back that it proves things that we already know without moving anything forward. My name is Homer Simpson. After spending five years and $100 million dollars, my findings summarized into this 500 page report shows that 1+1 does indeed equal 2. Well Duh. This is how government is run. It’s clear as night and day that gates need to be installed and latched up across every single station that Metro Rail serves. Stop wasting money with more studies. Just get them done, right now. Is what is needed is enforcement by fare inspectors with the authority to ticket and confirm ID of riders without paying fare. Now if someone on a train has not paid the fare and refuses ID for a ticket the inspector will just walk on because they do not want the confrontation that will accrue. Also gates will not help with the homeless, rowdy passengers and vendors on the trains. They will pay the fare and just ride all day. There needs to bee personal riding the trains for security as well as to see that the fare is paid. It take a lot of fare inspectors to pay for just 1 gate and will the gates even help all that much?. What ID check system do you suggest? If a person is riding Metro, they are likely not even be driving a car so they’ll have no drivers license anyway. And you can’t force everyone to get ID as a prerequisite to ride Metro. That’s stupid – in order to ride Metro, you need a drivers license or a state issued ID first. And what about people from other countries who come here as tourists? Are they supposed to be carrying around their foreign issued passports all the time as ID to ride the system? And how are you going to collect fines from people who live abroad? Oh I am from Buenos Aires, Argentina visiting Los Angeles as a tourist. Police says show me your ID, so I show them my Argentinian passport. Police says This ID is not valid and asks me if I have a drivers license. No, why would I have a California drivers license if I am a tourist from Argentina? Well you don’t have ID, so I’m writing you a ticket. You need to pay the fine. Sure, whatever, good luck trying to collect the fine from my bank in Argentina. What are you going to do? Spend $1000 and fly to Buenos Aires to try to collect $250? See where it goes? Nowhere. There is no law stating that people must carry ID at all times. Furthermore, what you cite is dangerous as it opens the door to becoming a Nazi-like police state where “show me your papers” become the norm just to travel the city. We are not 1930s Nazi Germany nor are we Pyongyang, North Korea where “people with authority” (which are likely to be abused) have the “power” to go around “asking for papers” just to get around. This will not help our city’s image nor our tourism industry. Many cities around the world have shown the way to operate a mass transit system without transcending into a “show me your papers” police state. Fare inspections should be left to the gates both upon entry and exit. Officers should focus on security of the trains and the stations and security only. How about last night at Wlshire/Western Purple Line station when as I was leaving and approaching the disabled turnstile the barriers moved aside for the person ahead of me then a guy pushing a bike wanting to enter started to walk through and when the barriers tried to block him he just pushed the bike through the gap between the barriers then walked through the gap himself. The pitiful alarm started to beep but he just went to the elevator and ignored it. This was circa 10 p.m. last night. As I have long stated, the value of these turnstiles has been way overstated for catching fare evasion and generating additional fare revenue. You make a good point, but Just Copy Japan also raises a good question. Perhaps we ought to look to easing some of the restrictions on eating and drinking on our system. Maybe at least allow plastic bottled drinks with twist on caps or something. As you state, people do it all the time and illegal vendors are there selling stuff. That shows that there is demand and instead of restricting and trying to enforce them, we should be promoting them and find out ways how to make additional revenue from such demand. These illegal vendors are operating within our system because there is a market system going on. But these illegal vendors do not collect sales tax. Why not legalize vendors to operate within the stations so that anything that gets sold by them, the city and county collects sales taxes? Those one dollar candies sold by illegal vendors can be 9 cents extra to the city and county if a 7-Eleven was operating within the station selling that candy. There’s money to be made here to help pay for transit. Furthermore, 7-Eleven will probably be able to sell those candies for a cheaper price over illegal vendors therefore eradicating the illegal vendor problem out of the system with competition. There’s a win-win situation here: more sales tax revenue and eradication of illegal vendors through competition. The increased revenue from sales taxes and rent income that are earned from legal vendors operating within the stations can help pay for maintenance, security, and janitors to clean the trains daily instead of being done all through taxes. If sales and rent income can help cover even 20% of the cost of keeping the trains and stations in good shape and order, that means 20% less tax dollars to be used to help maintain the stations and the trains in good order. 20/80 is better than 0/100. I disagree and say there’s a big difference. Before there was no way to be certain how big the fare evasion problem was under the honor system. Now there is data to show how big the problem was and Metro can now see how people are doing their fare evasion. Previously, the anti-faregaters would’ve said “oh that bike rider must’ve had a monthly pass so he didn’t need to TAP in to enter the system” and “there’s no way to tell if he’s a fare cheater or just a person who has a monthly pass” or “catching fare evaders will be impossible so it’s not worth even trying” or whatever to prove their point. Now, under a fully gated system where everyone must TAP-in to gain entry into the system, it shows that bike rider who went through the disabled turnstile barrier was just a fare cheater. Now we know, we have the data, and we can start figuring out ways how to prevent that moving forward. And if he does this constantly daily at the same hour and time and is being recorded on surveillance camera, Metro can now “filter in” (as opposed to finding a needle in a haystack of not knowing who is fare evading or not under the honor system) on that person to do a sting operation to catch that person red handed. Or if there is a particular station where a lot of people are abusing the disabled barriers to avoid TAP-in, then we now have the data to show that’s the station officers should pay attention to or staff officers there constantly as opposed to other stations where most people go through honestly through the gates. See how it makes everything more efficiently? It allows for more cost efficient options and strategies to be done to go after fare evaders, instead of an “one-sized fits all” strategy doing costly randomized fare checks. I would love to see L.A. Metro Rail stations look more like Japanese stations. Also, I’d either loosen the food rules or install newsstands at stations. No rule against reading newspapers/ magazines/ manga on trains, right? For that matter, just look at all the food vendors at Union Station directly outside the Red Line subway entrance. If people buy food/ drinks at Famima on the way out rather than on the way in, it’s not a violation. Alternatively, people can buy bottled drinks to take home. Just don’t open it on the train. That’s because you’re not thinking logically and thinking what computers and machines can do. Previously, all we had were security cameras. Security cameras do very little to catch fare evaders because video recordings cannot fish out who did the fare evasion or not, especially more so under the honor system. That bicyclist blends in with all thousands of people going in at that station so it’s an impossible task to go and find him or even compile a data pattern of his usage of the system. Trying to catch a fare evader under the honor system using random fare checks is like trying to find a white cat under a snowstorm. Finding Waldo is a much easier task than trying to find a fare evader under the honor system. But now, we have a computerized fare gate system along with those surveillance cameras. Now, you may think that only the “pitiful alarm” did nothing to catch that guy and that fare gates do little to fight fare evasion. But when the alarm goes off, it creates a log data, a timestamp if you will, of when the alarm was triggered. So the gate will have the information like “2013-07-25 22:00:00 – alarm triggered.” Now Metro can filter back on the surveillance camera to that time rather than re-watching 24 hours worth of surveillance camera footage and trying to weed out the info out of the thousands of riders entering the system daily. It focuses attention only to the time the alarm was triggered so that surveillance footage could be viewed only at that time. Think of it like how burglar alarm work when it’s triggered at a jewelry store late at night. Alarm puts a date and time stamp when it went off. And if you know when it went off, it’ll help the cops and investigators to do their jobs much easier and more efficiently because all they have to do is go back to the surveillance footage of when the burglar alarm was triggered instead of watching the entire video footage that was taken during that night when the jewelry store was robbed. Add to that, if there is consistency going on where this bicyclist is always triggering the alarm, let’s say between 21:00-23:00 every weekday, then a pattern emerges. If this person is a constant fare evader, now Metro has all the proof they need to go after him for $250 per fare evasion via footage caught on camera further backed by the timestamp of when the alarms of the gate were triggered. Because if this bicyclist is doing this daily, all Metro needs to do now is put undercover cops at Wilshire/Western between 9:00-11:00PM, wait for the unsuspecting bicyclist who thinks he’s always getting away with this, to be caught red handed, arrested as a constant fare evader and charge him with a fine for $250 fine x every single time he triggered the alarm and Metro has all the proof they need to press charges after him. Now do you see how installing gates make a huge difference? Now, add this same level of anti-fare evasion tactic if Metro implements a TAP-out system where gates are latched for exit. If this bicyclist thinks he’s getting away by fare evading through the gates at Wilshire/Western and thinks he got lucky when he reaches his destination, wait until he is surprised he can’t get out of the system because there’s no TAP-in data on his TAP card and the gates will not unlatch for him to exit the station at his destination. Then an officer will come and say “well, well, well, looks like we caught another fare evader who thought he could ride the system for free.” Now you further added an extra layer of anti-fare evasion tactic. And even if there were no officers around, and if he tries to ram his way through, same thing – timestamp of when alarm triggered, match that up to surveillance camera, pattern emerges, charge him for fare evasion. The system HAS become more difficult for fare evaders. And these are just only the few ways Metro can do to fight fare evasion. Metro can add permanent station staff or strategically place police officers in a station box to keep a close eye for those who triggered those alarms. Costs for them can be paid for in many ways like adding retailers and merchants into the stations and by collecting rent and additional revenue from sales taxes which is one method Just Copy Japan and Jason Grant has suggested. Technology is wonderful and makes things work more efficiently. You just need to think logically on how they work, how they interact with each other, to see how it all plays out to create a system that puts an ever tighter noose against fare evaders. There’s no such thing as 100% fare evasion prevention. But uses of technologies all working together can reduce it to make things tougher against fare evaders. And I think fare evaders know that. And that’s why they don’t want it. “…revenues are up…” Where is proof of this? Ride the Blue Line and you’ll see food vendors INSIDE the Blue Line cars – in spite of “no-eating, drinking, or smoking” signs in each car. Rule-breaking goes on unchecked and undeterred. “Freelance” “entrepreneur” food vendors (and panhandlers) presumably driven by their own relative level of poverty and “lack-of-work” . A few police officers on each car will eliminate this. Rats (i.e. mice) are already visibly scurrying around on occasion along L. A. Red Line trackage rights-of-way. NYC Subways have been notorious for years concerning their rats (ground-level Manhattan’s well known to be full of them already). If you seal off all the Blue/gold lines’ at-grade stations, as has been rightfully proposed (to avoid fare-evaders), then you’d better seal them off completely – that is, with the addition of glass walls, sliding doors at ALL platform-track interfaces. Otherwise many determined fare evaders will walk along the tracks, and jump onto onto platforms, in order get those (un-policed) “free” rides they’re now used to having. If this isn’t also done as part of the fencing-off process, then there’ll be many other inevitable instances of train-pedestrian “accidental” collisions. If illegal vendors are there and it’s a problem that’s unenforceable, the city might as well legalize it by issuing business licenses, collecting sales tax from goods sold and provide the vendors with the space available for rent at the stations to conduct their business activities. We are not Detroit where we tell people where they can or cannot conduct their business. Look what happened to them. We are Los Angeles, a city that should be promoting businesses to thrive. But it has to be done legally. Looking forward to reading the first lawsuit filed after someone gets hit by a train because they were walking along the tracks in order to hop up onto the platform to avoid these new turnstiles. But it will be worth it since he or she will not get a free ride on a train. Most likely, any idiot who wishes to go to such extremes to freeload will get no sympathy from the public or the courts. OTOH, it will be another be a nominee for the Darwin Awards. I love it. The jig is up freeloaders! Metro is finally waking up to reality. Move forward with this chop-chop with absolutely no delay! We needed gates a long time ago instead of waiting for years to solve the problem that we all knew was happening. Metro should’ve been responsive to this years ago instead of taking until 2013 to get this done! Why is LA so far behind the times with everyone else! I agree that Metro should do TAP out too. That’s how Atlanta and San Francisco BART does theirs too so that freeloaders who cheated through the entry gates will have no way out of the exit gates. Transit services should only be used by those who pay into the system, not those who take advantage of others to pay for their rides. Josh, Google “attractive nuisance” please. The only people who have a problem with a gated system are those have been abusing the honor system at the expense of taxpayers. It should’ve never taken this long to fix this. Who in their right mind designed a system without gates and would think it would work in Los Angeles! Hasn’t anyone working at Metro taken a trip to cities like Hong Kong, Seoul, Tokyo or London or even to San Francisco, Boston, Philadelphia, NYC, or Washington DC? And don’t give me the “we didn’t know it wouldn’t work” excuse either. LA has had all these people from other cities in the US and from the world like from Britain, Canada, Mexico, Thailand, Vietnamese, Japanese, Chinese, Koreans, and the rest of the world who all come from places with better transit system than LA. LA should be listening to what they think we should be doing because they know how better their mass transit are than ours. LA should stop wasting money all the time by trying to reinventing the wheel with ideas that don’t work! Listen to the people who used to live in San Francisco. Listen to those who used to live in New York. Ask the British and Canadians for advice. Learn from the Asians who know first hand how transit is run successfully and profitably in places like Bangkok, Tokyo and Osaka, Seoul, Beijing, Shanghai, Taipei, and Hong Kong. Do all of that and LA would have a great system instead of listening to people who know absolutely nothing about how mass transit and keep messing everything up. I am glad that someone finally had the guts to move things forward by actually doing something to fight fare evasion. Metro had run things under the honor system too long. This is despite the years of complaints from the public to fix the fare evasion problem. But it has always fallen on deaf ears. Unfortunately, I think it’s too late. Gate latching all the stations is going to cost a lot of money to do. This is exactly why poor planning costs more money to fix down the road. Since it’s their fault for this mess, the cost of installing fare gates to all the stations should be funded by slashing the pay of all the Metro executives by 20% for the next ten years and have their paychecks fixed and capped without raises. Why should the Metro CEO be paid $325,500 a year for running Metro under the honor system? Why should the Metro Treasurer be paid $160,000 a year for his (or her) lack of financial knowledge that the honor system would even work? Everyone who are in these positions are being paid way too much for their lackluster performance of their jobs. It’s common sense that people should be paid based on their performance. And this whole honor system mess and the costs that are going to be needed to fix this shows that Metro’s performance were not to expectations. These people can easily afford 20% paycuts as punishment for their past actions. If everyone on that executive compensation table gets a 20% pay cut for the next 10 years, that’ll at least in some way, help pay for the cost of adding faregates to each station and making necessary upgrades to do so. They need to be held liable for their actions. This 20% pay cut for 10 years with no pay raise will serve a lesson for Metro employees to stop making stupid decisions, stop wasting taxes and start doing their job. I did and I see nothing there that has to do with gates. What you’re trying to say is so out of proportion, it’s just like saying fire trucks attract the attention of children and if children get too close to it, they may get run over by a fire truck, therefore fire trucks should be banned and the city should be sued for buying fire trucks. Furthermore, you have another California city up north called San Francisco where they run perfectly fine under a gated system. If it clearly works in another city in California, why do you think it won’t work in Los Angeles which is a city in another part of California?